What we get is an interesting fantasy world that has a well thought-out mythology and that is well fleshed-out in all its little details. Add the fact that this world is populated with interesting characters, each with their own backstory and motivations, and we get a very believable, intricately-woven drama. Both Lee Jun Ki and Shin Min Ah are fantastic in this. They weren’t kidding when they promoted Arang as a fantasy drama. This world has it all: gods, fairies, ghosts, reapers, shamans, talismans, reincarnation, possession, and even a heavenly goat with flowers growing on its back. If you think that sounds fantastical, you’d be absolutely right. It is. Yet, it isn’t hard to get into this world and understand its mythology and the rules by which everything works. 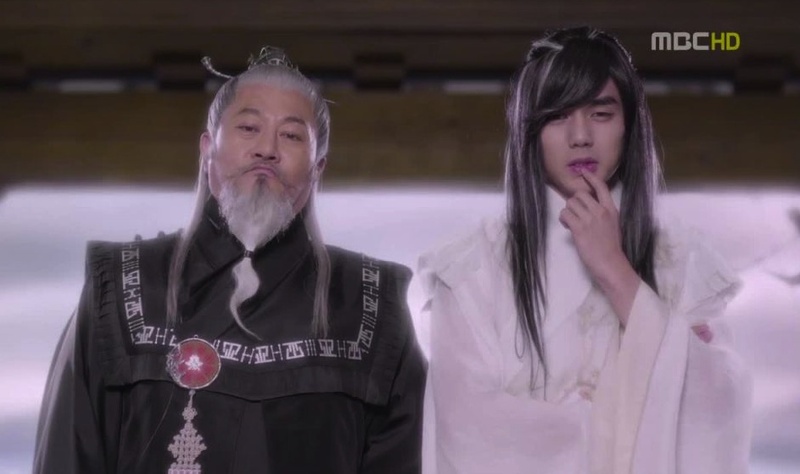 It’s not stated explicitly in the drama, but the promotional material tells us that the kings of Heaven and Hell are twins (Yoo Seung Ho and Park Joon Gyu respectively). Not only are they twins, but King of Hell is the YOUNGER twin. HA! I really wish they had made that explicit in the drama, instead of simply alluding to it. I mean, knowing that context tickled me pink and added so much extra meaning to their interactions. The privilege of knowing that context shouldn’t be exclusive to those who have access to promotional information. It works on its own, but when you know they’re twins, and that King of Hell is actually younger than King of Heaven, it’s flat-out hilarious. And we should all get to be privy to that joke, no? From the moment the drama kicks off, it’s action-packed, interesting and intriguing. 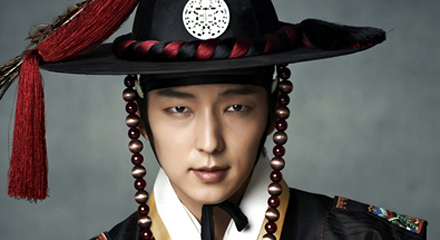 We wonder why Eun Oh (Lee Jun Ki) can see ghosts, and why he won’t tell even his trusted servant Dol Swe (Kwon Oh Joong). Why is he, a nobleman, wandering around like a nomad? And why does he act so indifferently to everyone and everything around him? At the same time, we also wonder about Arang (Shin Min Ah). Why is she always on the run? Why is she so street-wise? And most importantly, why is she dead? The writers handle the story with such assurance and dexterity that you never feel like they don’t know what they’re doing. They reveal information piece by piece, layer by layer, allowing each reveal to take place at just the right time, and no sooner. Yet, there were many times that I felt surprised by how soon certain things were revealed. In another drama, I would have expected the writers to save certain juicy bits of information for the very last stretch. Instead, we’re treated to answers often sooner than we expect, and that really kept me on my toes. This drama is definitely different, and it keeps things fresh. There are plot developments that I don’t ever see coming, and that’s quite a feat, considering how many kdramas I’ve watched. I never felt bored with this drama. The chemistry between Eun Oh and Arang is fantastic. The characters are well-matched, wit for wit, answer for answer. Their energy levels are always on par, and you never feel like one character is more important than the other. Lee Jun Ki and Shin Min Ah were great in their roles. They really became Eun Oh and Arang for me, and their deliveries were both excellent. Lee Jun Ki had some really heartrending scenes and he really gave it his all, as did Shin Min Ah. I’ve enjoyed Lee Jun Ki in other dramas before, but I am really taken with the new substance and presence that the military has given him. The more chiseled look becomes him, in my opinion. It gives him a more manly aura, whereas before, he was more pretty than obviously manly. I’ve always appreciated Lee Jun Ki as an excellent actor. His turn in The King and the Clown was particularly impressive. But I’d always wished that he was a little less pretty and a little more manly. And here, he is. And he uses it to such great effect. When Eun Oh begins to step into his magistrate role for real, the intensity blazes from his eyes. It’s pretty spellbinding. Lee Jun Ki also did all his own fighting, which I think really makes a difference. It adds to the sense of realism not to have stunt doubles. You know he’s fully committed. You can just feel it. Shin Min Ah is amazing as well. 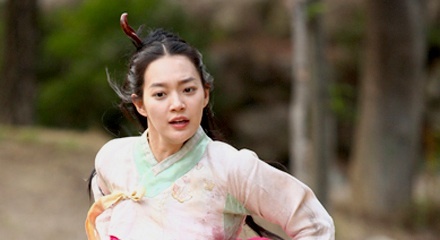 Arang is often roughed up, running, kicking, screaming, and hung from high places. And Shin Min Ah does it all. With gusto. And all that running that she has to do while holding up her skirts. That’s no stunt double – she has to do all the hard work. Who said being an actress was easy? This role is definitely a hard-core hands-on type of character, and Shin Min Ah does it wonderfully. I enjoyed her Arang very much. She is by turns outspoken, brash, pensive, scared, shy, shrewd, spontaneous, clever, clueless, and all around awesome. 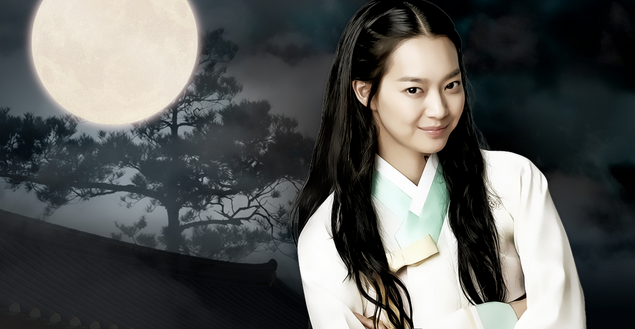 I think Arang is the most awesome heroine in recent kdrama history, and Shin Min Ah brought her vividly to life. Which is a little ironic, if you think about it, since her character is dead, heh. The rest of the cast is fantastic as well. Everyone played their roles in a faceted, layered manner, which added to the three-dimensional nature of the world. No one actually felt flat and two-dimensional. The characters were all complex and fleshed out. Even the Big Bad had her own motivations that we could understand at a very basic level. Special mention goes to Han Jung Soo, who played Moo Young. I was fascinated by his character. Moo Young was supposed to be an unearthly being with no memories or ties to this earth or the life he had lived while on this earth. Yet, he seems to be unable to completely forget. Han Jung Soo portrayed his conflict really well, I thought. I felt for his character. His Moo Young goes about his heavenly business with single-minded focus and dedication, and yet there is a sense of wistfulness about him that sometimes peeks through. I felt his conflict early on even though I didn’t know what that conflict was until much later. I was moved by his love for Moo Yeon, and how he decided that he would die with her so that their fate would be resolved once and for all. The moment that he drove the dagger into her was heartbreaking. You could tell what a difficult thing it was for him to do, to destroy the one he loved and who loved him. And as if that wasn’t heartbreaking enough, his expression of love, regret and profound sadness as he then drove the dagger through his own heart just magnified the heartbreak tenfold. He gave up his very existence for the one he loved, even as he had to kill her to save her from herself. It was moving and thought-provoking to behold. I really liked Moo Young, and I’m glad that at the end, he got reincarnated, even if he became the heavenly goat. Because in line with the train of thought that runs through this drama, existing as the heavenly goat is better than not existing at all. I really liked how the writers dealt with each character very thoughtfully in the way that the drama ended. Each character had his or her own resolution, and no one was overlooked. With so many characters populating this world, that is quite a feat. There were a few spots in the writing where I felt the show falter a smidge, like when Arang’s actions smacked of noble idiocy a bit too much in the later episodes, but overall, this was a well thought-out show. All in all, I liked the ending. I did sort of wish for an ending that didn’t involve them only getting their happy ending in their next lives, but in the context of this fantasy world, I find it acceptable. Another netizen pointed out that this way, they get to live their new lives in ways that they never could in their previous lives, truly being happy, having good childhoods like they couldn’t before. I especially like the fact that Arang is reborn with her memories intact. Not only was that something that was so very important to her in her previous life, but it also means that their present lives are more like extensions of their previous lives, and not like a do-over. I get that it’s written in that Eun Oh doesn’t remember coz that gives us the cute end scenes of Arang badgering him about why he drank from the well of forgetfulness when she told him not to. The way that Lee Jun Ki played it, with that hint of cheekiness on his face, I can easily imagine that Eun Oh actually does remember, and is just pretending not to. And that thought is what makes the ending quite perfect. Another netizen pointed out that young reincarnated Eun Oh spoke like a little adult. Arang and Eun Oh spent most of their time together piecing together mysteries and fighting baddies, and had only a few romantic scenes together, and even those were bittersweet. It was only in the last few minutes, where we get a glimpse at their reincarnated selves, that they have a bit of truly carefree, sweet romance together, and I replayed it at least 6 times to soak it all up. Arang and the Magistrate isn’t a perfect show, but it gets pretty darn close. I love this song from the OST! As a bonus, there are English subs for this vid, and a nice amount of screen time for our OTP. The English subs made a huge difference to my appreciation of the song when applied to the context of the drama. One might find the phrase “my beautiful person” weird on its own, but the lyric makes a ton of sense when seen in the context of the drama, because that was Arang’s quest all along, to be a person, to be seen as a person, and to be remembered as a person. That the lyric keeps addressing her as “my beautiful person” makes it so poignant, so meaningful and so lovely. Categories: Review | Tags: 2012, A, Arang, Arang and the Magistrate, Han Jung Soo, Lee Jun Ki, Park Joon Gyu, Review, Shin Min Ah, Yoo Seung Ho | Permalink. I love this drama too! (though I haven’t finished it yet OTL). Funny, I saw both of them while I was at MBC (for I Do I Do’s last filming day). They keep passing by the lobby and I just ignored them (all thoughts are with Kim Sun Ah). I didn’t know I’ll love them and their drama months after. I should’ve asked for a photo! They were even on their Episode 1 hanboks! ㅠㅠ Oh, regrets! Lesson learned: If you saw an unknown drama filming and you saw the actors are free, try having a photo opt. Who knows you might like/love the drama in a few months! Ahhhh our beautiful Satto and delightful Arang! Such a lovely journey this drama led me on! LJK and SMA were wonderful. I was trying to determine my favorite romantical moments they shared and decided that Arang tending to his wounded arm, buttoning his jacket and professing her love is probably my fave and in fact garnered multiple rewatches. Of course, Eunoh measuring her for new clothes caused moments of squee and his dream: ❤ <3<3<3! Arang & Her Magistrate will definitely make my personal rewatch list. Now I must finish SD to swoon over R and drool through Chuno!! Then it's YSH time! First of all, I just LOVE how you’ve renamed the drama Arang & Her Magistrate!! ❤ ❤ ❤ The Hangul DOES lend itself to this translation too, but all I'd thought of was the literal Arang's Magistrate. LOVE this title way more! This is a title that they could've even used officially, though I can understand why they chose to go with Arang and the Magistrate. I loved what you said about the ending, the idea that Eun Oh does remember her but is just teasing Arang by not admitting it. I was happy with the ending, but I admit I did find it a little sad that Eun Oh has forgotten Arang and everything they went through together, and that little idea makes me so much happier about the whole thing. PS: I don't know if you've already seen it in the comments above, but my friend Michele pointed out that the Hangul can be translated to mean Arang and HER Magistrate, which I LOVE! I'd missed that fact, coz I wasn't able to read Hangul at the time that I watched this drama. Now I'm very taken with that thought, tho! YAY that you enjoyed Arang and the Magistrate, kaiaraia!! 😀 It’s one of my faves, and it’s rather underrated, imo. 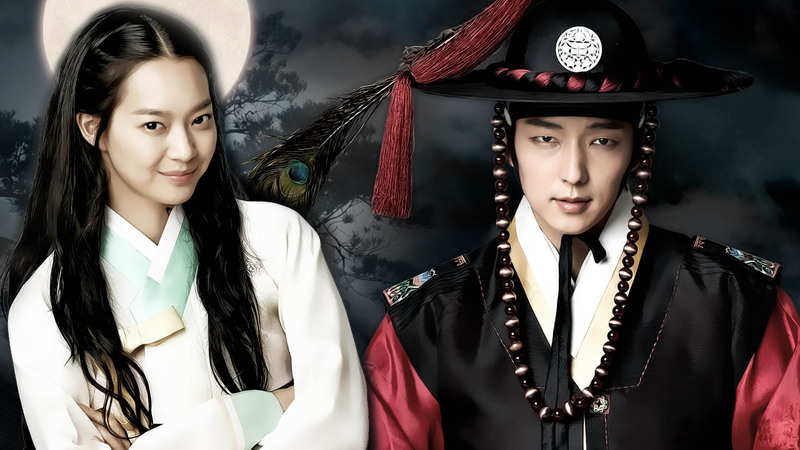 I LOVE Lee Jun Ki and Shin Min Ah in this! They are individually so good, and they are also really fabulous together. These two were perfectly cast, I think! 😀 Yeon Woo Jin was very good too, I hafta agree. He portrayed his character’s conflict very well, and even tho he wasn’t a “good” character per se, he made him sympathetic. Kudos to him and to the writers for that. I don’t remember the rap bit, but I do have some enduring favorites from the Arang OST. K.Will’s song being my favorite. Ahh. So meaningful too! Listening to it makes me want to watch the drama again! I love the drama from beginning to the end. It has a little of everything for all viewers. The use of rap during some select scenes seem incongruent as well as the use of Abracadabra but the scenery was beautiful, the acting by the cast was superb and the special effects such as the death wand used by the Death Angel creative and believable. The wardrobe seemed appropriate for that era as well. Each episode ending build up suspense as to what would happen next to Arang and the Magistrate. Most of all, the ending episode was not a tragic ending for the lead actor/actress as is the practive in most dramas. Like the Magistrate I would also have gone to Hell to save a girl like Arang. One Puzzling Question: Why did the women have tattoo on their neck in this drama? I just finished this show and I couldn’t believe it was over 4 years old! It was so well made and the production and special effects were really good. I am a life long fan of Lee Jun Ki now 😀 he was just so good to look at and an amazing actor! I do wish the show focused more on the happy ending. What did Eun Oh and Arang do in their next life? Did she become a famous poet? Did he become a magistrate again? We could’ve gotten more of that instead of a prolonged climax. I skipped episode 18 and 19 because I felt they were taking too long to resolve matters. Great show despite flaws though! 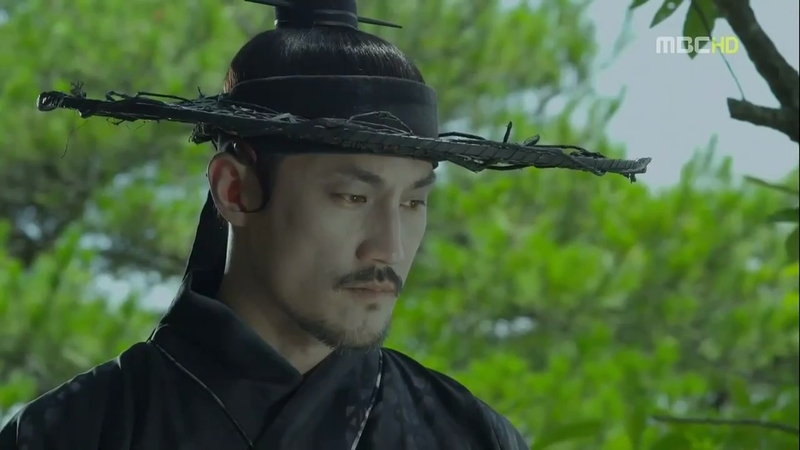 I never thought I would enjoy a historical K drama and am glad I gave this a shot.